FRAGRANT plants have a particular allure in a garden, adding another level of sensory experience on top of the visual one. In warm climates, we rely on some old favourites like murrayas, gardenias, frangipanis and jasmine to provide scent. In the past few years, several forms of daphne have been bred to withstand the heat of the subtropics, and this is great news for those of us who love perfume. Daphne Eternal Fragrance and Spring Pink Eternal Fragrance are the result of more than 30 years of work in the UK by renowned plant breeder Robin White. They have that wonderful scent, but are more heat and dry tolerant, making them much easier for us to grow than their cool climate relatives. 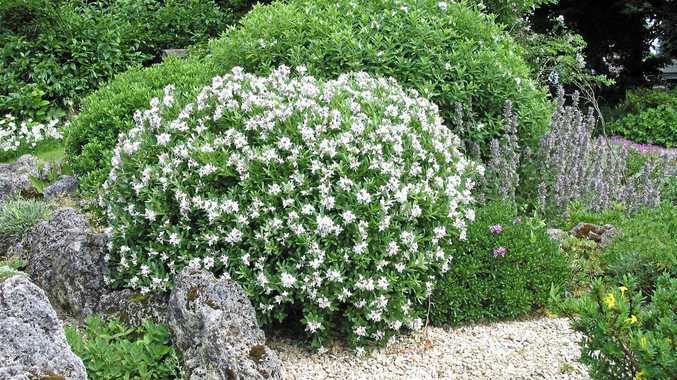 Eternal Fragrance has clusters of strongly scented white flowers in spring, and will spot flower throughout the year. Spring Pink produces dark pink flowers that fade to white as they age. It also continues to spot flower throughout the warmer months, but the colour is less intense. These daphnes form a low, spreading shrub, about 60cm tall and 90cm wide. The oval-shaped dark green leaves are about 2-3cm long. The New Zealand-bred Daphne Perfume Princess is the earliest and longest flowering of all daphnes, and is prized for its profusion of large, intensely fragrant blush pink (softly fading to white) flowers. The foliage is much larger than the Eternal Fragrance series, and a brighter shade of green. These daphnes will grow best in a frost-free position in sun or semi-shade, ideally with protection from the hot afternoon sun in summer. They would also do well planted in the dappled light beneath open canopied or deciduous trees. While they will grow happily in most soil types, they do need good drainage. If you have very heavy clay soil you might want to create a mound and plant into that. Definitely add compost to the soil at planting time. Keep the root zone well mulched to protect it from heat in summer and cold in winter. Established plants have some drought tolerance, but extended periods in dry soils may have an adverse effect on flowering. Daphnes can be slow to get established and are best left undisturbed once planted. Once they are established, they will require only occasional attention - keep them mulched and water as required. Prune lightly in summer after flowering to maintain a good shape, and feed with a well-balanced fertiliser. Don't be tempted to prune too hard as you may not get regrowth if you cut into hard wood. The classic green foliage makes these daphnes ideal for a small, fragrant hedge. They are also great in pots.